DeLaney Community Farm is a partnership between Denver Urban Gardens (DUG) and Project Worthmore (PWM). Our joint mission at DeLaney is to support refugees from the local community through community-based food security programs. The primary goals of DeLaney are to: - Provide the space, support, resources, and expertise for refugees to grow healthy, organically-produced food for themselves and their broader community; - Foster community development and integration through education and training programs, and relationship building; - Connect refugees to the local fresh food economy through meaningful and dignified experiences; - Demonstrate small-scale, sustainable agricultural practices that reconnect refugees with the land in a productive and environmentally responsible manner. 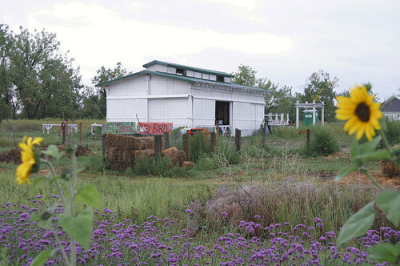 DeLaney Community Farm sits on the 158-acre historic property, DeLaney Farm, located at 170 S. Chambers Road (between 1st and Alameda), on Aurora Parks & Open Space land. The farm is situated on one of metro Denver's most scenic and rare pastoral areas and is accessible by Highline and Tollgate Creek bicycle and pedestrian trails, cars and bus. If you are interested in learning more about the historic DeLaney Farm, please contact the Aurora History Museum. Local Honey and Soap sold on site at DeLaney Community Farm. Reviews of DeLaney Community Farm are below. All comments will be moderated, so please keep them helpful. Did you like your experience? Was the farm clear about expectations? Did the farmer deliver on his or her commitments?